Mythic Championships are the way to rise to the very top of competitive Magic. However first one must pass its qualifier. With this ticket you guarantee yourself a place to compete during this prestigious event. 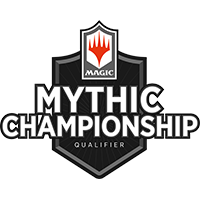 The Mythic Championship Qualifier will take place in Brussels on 12/05/19. When purchasing you may only buy this ticket and nothing else. Furthermore you may only purchase one ticket at the time. Don't forget to write your name and DCI-number in the comment box. If you do not we will contact you by mail in order to obtain this information. Once we have it you will be put on our qualifier list and there's nothing left for you to do than show up and defeat all those before you! We only have 226 tickets to sell so don't hesitate if you want to compete. They're expected to sell out fast!